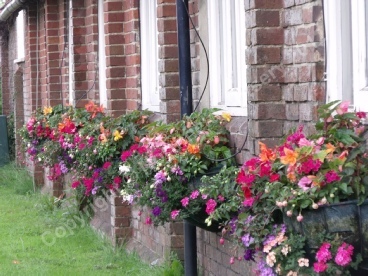 When we are not busy growing and creating our flowers to produce the hanging baskets or preparing deliveries, we are available to advise about and install watering systems to keep everything looking fresh and beautiful with minimum effort. We are sorry that we cannot currently provide watering systems between the months of February and October. 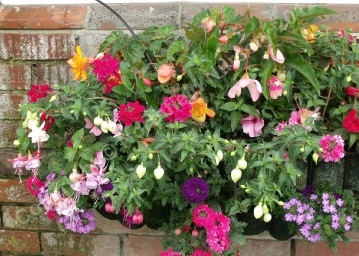 Our systems make watering and irrigating hanging baskets and other installations easy, using the same technology as we use in our poly-tunnels and greenhouses. Our installations feature a network of discrete narrow tubing that is attached to the mains water supply to feed water directly to where it is needed. We offer simple manual installations that are connected to a single tap, or we can design and implement more complicated automated systems with electronic timers. All the systems we offer are devised to suit your particular needs, and are tailored to your location. We meet you on site to devise what is required and set everything up for you, providing full instruction. Our charges for water systems include maintenance and support advice. Quotes are available on request, or contact us so we can have a chat to see what would suit you best.